A medley of mixed greens topped with tomatoes, cucumbers, onions with a blend of apple cider vinaigrette served w/ pita bread. Mixed greens topped with smoked turkey, ham, lettuce, cucumbers, tomatoes & hard boiled egg. 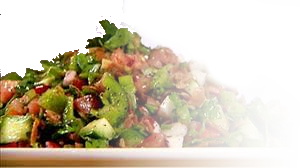 Chopped parsley, tomatoes, a hint of onions and cracked wheat in a light lemon dressing. Romaine lettuce tossed with tomatoes, cucumbers, onions, radishes, green peppers and sumac vinaigrette topped with crispy pita chips. Medley of mixed greens, topped with marinated & grilled chicken, w/ tomatoes & cucumbers.